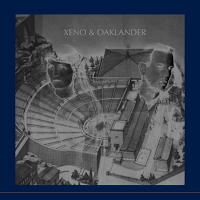 The first song available from Xeno & Oaklander's upcoming album, Sentinelle, "Saracen" is now a featured download of the week @ Other Music. Serene yet brusque, with synthesizer squeals and static squalls ornamenting its foreboding edges, "Saracen" is an apt analog for October's impending chill. Whether the title references Medieval followers of Islam or something completely beyond, Sean McBride's detached refrain matched with Liz Wendelbo's delicate vocalizing en Francais makes for a bewitching encounter. "Saracen" is driving intrigue, brooding restraint, and the result of compelling Xeno & Oaklander craftwork.